Golgoth Studio, a new independent video game studio based in France, have just revealed that Toki Remixed, a HD remake of Toki released back in 1989 by Tad Corporation, will be available soon on Steam, XBLA and PSN. 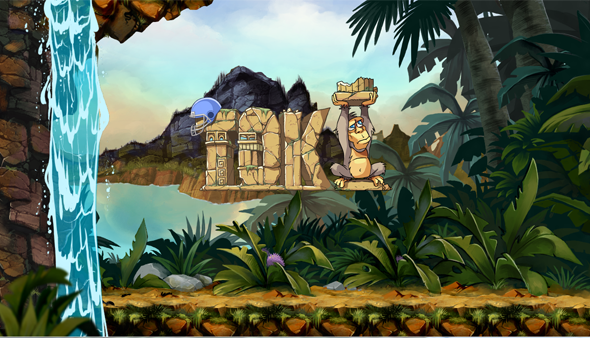 In Toki player takes control of a muscular ape who must battle hordes of jungle monsters with energy balls from his mouth. Toki’s ultimate goal is to destroy the evil wizard Vookimedlo who cast a spell on him that turned him into a chimpanzee and regain his human state, and save his beloved princess, Miho. Toki became quite popular after its launch and was ported to the Amiga and Atari ST consoles. Taito also published ports for the Atari Lynx and the Nintendo Entertainment System, while Sega would later reprogram and retool the game into an exclusive version for the Sega Mega Drive/Genesis known as Toki: Going Ape Spit. No pricing details have been revealed for Toki Remixed as of yet.